Though the French founded Sao Luis, making it unique among Brazilian state capitals, they'd barely established a settlement before Portugal took over. Today, the city boasts the most well preserved colonial architecture in all of Latin America. Indeed, its historic centre is a UNESCO World Heritage Site. Visitors usually enjoy its shabby, picturesque charm. Sao Luis is also one of three Brazilian state capitals built on a collection of islands, which adds considerably to its allure. Pastel-coloured mansions, craft shops and art galleries enchant tourists. A lively reggae scene and vibrant Afro-Brazilian culture make sun-filled days unforgettable. Quaint streets are beyond tempting in the moonlight. 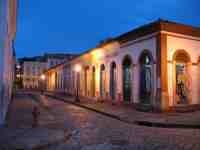 Still, visitors should not explore Sao Luis alone, especially at night. History lovers will enjoy visiting the lovely historic town of Alcantara. Lying just across Sao Marcos Bay, its aura of laid-back tropical decay seems only to have enhanced its charm. Trivia fans should note that many celebrated poets and writers have called the city home, including Brazil's national poet, Gonçalves Dias. We are looking for contributors for our Sao Luis travel guide. If you are a local, a regular traveller to Sao Luis or a travel professional with time to contribute and answer occasional forum questions, please contact us.